Standby! Full dialog and numbers for the interactive map coming shortly! CBMBA’s Guiding principles are a list of concepts CBMBA refers to when deciding the validity and priority of proposed projects. CBMBA encourages the use of existing trails and proposed new trails throughout all the drainages so that any one particular drainage does not get overwhelmed. Trail diversity. CBMBA believes in developing a network of trails that offer options for riders with a wide spectrum of skill and fitness levels. CBMBA values the importance of trail projects that encourage bikers to ride off of roads and onto singletrack trails. Trail projects close to high population areas including Mt. CB, CB, Brush Creek, CB South are of high importance. Connectivity of drainages. Trails connecting major drainages have high priority. CBMBA hopes all local drainages can eventually be traversed and connected by singletrack trail. Singletrack connectivity. Using the development of Hartman Rocks as an example, CBMBA strives to have one singletrack trail lead into another singletrack trail in close proximity. CBMBA values building trails with sustainability first and foremost in mind so as to limit environmental impact and need for future maintenance. Collaboration. When serving the mountain bikers interest, CBMBA encourages collaboration with all user groups, stakeholders, government, and non-government organizations. CBMBA’s Master Plan and Action Plan are living, flexible documents. CBMBA supports a level of flexibility that allows the club to entertain attractive new unforeseen projects and incorporate them into the Master Plan at any time. Preference for working on non-motorized trails over motorized. CBMBA supports the development of loop options of varying length. Overnight work days should be reserved for somewhere relatively remote. CBMBA supports the connectivity of communities via non-motorized travel. CBMBA works to balance recreation with conservation, stewarding natural lands and minimizing the environmental impacts of trails when possible. CBMBA encourages using lesser means of impacts to access trails. (ie. – ride from Town/less shuttling). Disclaimer: The following document is a conceptual plan. This is a living document and may include the elimination or addition of additional routes in the future. The trails are conceptual with approximate starting and ending points. Many of the trails have not been scoped on the ground and exact alignments will be decided upon approval of the trail concept. CBMBA does not presume to have permission to cross private property or implement any trail plan without permission from all proper stakeholders and agencies. One of CBMBA’s primary guiding principles is to build trails that get riders and non-motorized users off of busy, dusty roads, and onto sustainable singletrack. The creation of these trails would allow for safer travel within and between drainages. It would also create better user experiences and trail connectivity, and encourage users to drive/shuttle less. As the volume of users and visitors continues to increase in the valley, CBMBA wants to minimize risk of interaction between autos, motorized recreation, bicycles, and other user traffic. CBMBA feels these projects will have minimal to no impact on wildlife habitat fragmentation and will have great public benefit. Most of the proposed are ‘parallel’ trails in existing high use areas that will not only add miles of singletrack to the map, but create opportunities for more ‘beginner’ level singletrack, in addition to getting riders further dispersed on the trail systems. All of this by a means of safer, responsible, and connected network. CBMBA’s 5 year plan is focused on Riders off the Road. It is a ‘big picture’ proposal to connect existing trails and networks of trails with a safer means of travel and better experiences. It is also a means to mitigate the heavy impacts many drainages are seeing with shuttling and trailhead access. In 2015, the scary, yet inevitable happened. 2 local users, one motorized, one non-motorized, collided head on – on Cement Creek Road. Both men went to the hospital and sustained heavy, yet recoverable injuries. They were lucky! They are not the only collisions, and many, many more ‘near misses’ are regular occurrences. With increased users, more technology, faster speeds, and easier access into the further reaches of the National Forest, it would be irresponsible to not consider ways to mitigate these issues with simple, smart solutions. CBMBA intends to support all efforts to connect the communities of Crested Butte and Crested Butte South. CBMBA feels it should be a high priority to connect our largest population centers by muscle-powered recreation. There are many obstacles for this connection, and many stakeholders – public and private – to collaborate with. Proposed routes are conceptual and CBMBA does not presume to have permission to cross private property, nor mean any malice or ill-will in proposing such routes. CBMBA believes that connecting two existing trail systems and communities by a remote, non-motorized backcountry trail is highly desirable and would provide the most sought after in trail experiences. 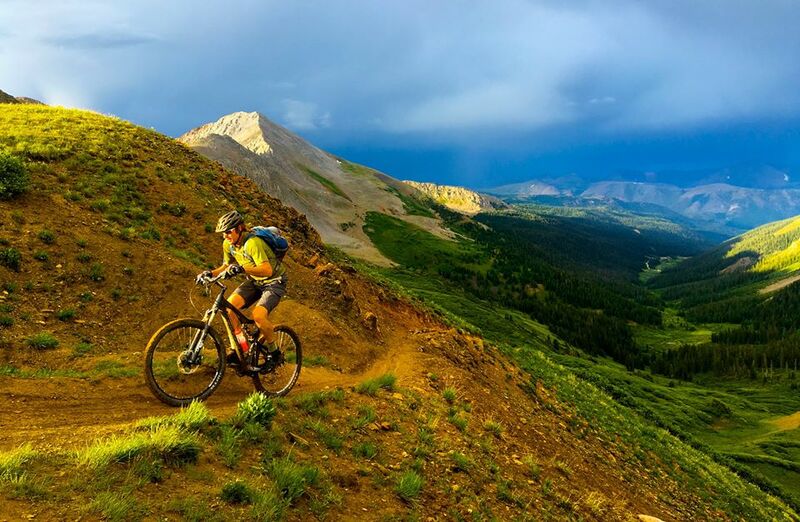 Over 40 miles long, the trail is proposed to connect with Baxter Gulch on the Crested Butte end, and the Signal Peak Trail system on the Gunnison end. CBMBA means no ill-will by proposing this trail in conjunction with Gunnison Trails, and realizes there are many obstacles to overcome to see this trail ever come to fruition. 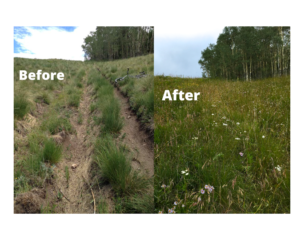 We believe an adaptive management approach, along with continued collaboration with local stakeholders and the ranching community, would create a well-managed and maintained trail for the benefit of all users. CBMBA intends to work with the Pitkin and Gunnison Counties to see this trail come to reality through Governor Hickenlooper’s 16 in 16 project. The highest priority sections are connecting the Wagon Trail to Horse Ranch Park and Lost Lake Rd. CBMBA would like to see a singletrack trail from Star Pass to Aspen following the basic route of the Elk Mountains Grand Traverse. Singletrack exists up to Star Pass, but the route is multi-use, low quality jeep road from Star Pass to Aspen. CBMBA would like to, someday, see this become a singletrack experience to the Town of Aspen. 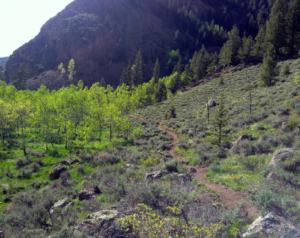 Trail additions would be in Pitkin County. Disclaimer: This document is a conceptual plan. This is a living document and may include the elimination or addition of additional routes in the future. The trails are conceptual with approximate starting and ending points. Many of the trails have not been scoped on the ground and exact alignments will be decided upon approval of the trail concept. CBMBA does not presume to have permission to cross private property or implement any trail plan without permission from all proper stakeholders and agencies. CBMBA has made a commitment to the USFS that any unsustainable trail that is realigned will be restored to a natural habitat to benefit the natural landscape and wildlife.